[Stride]-Stride Step-[Choose one or more cards with the sum of their grades being 3 or greater from your hand, and discard them] Stride this card on your (VC) from face down. 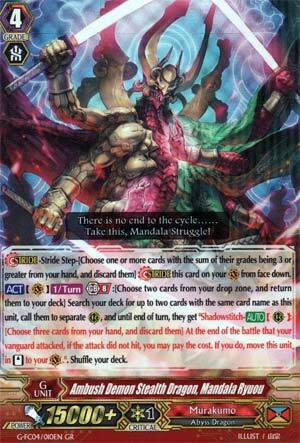 [ACT](VC)[1/Turn] Generation Break 8:[Choose two cards from your drop zone, and return them to your deck] Search your deck for up to two cards with the same card name as this unit, call them to separate (RC), and until end of turn, they get "Shadowstitch-[AUTO](RC):[Choose three cards from your hand, and discard them] At the end of the battle that your vanguard attacked, if the attack did not hit, you may pay the cost. If you do, move this unit in [Stand] to your (VC).". Shuffle your deck. Well on one hand having multiple Vanguard attacks is pretty neat. On the other, considerably weightier hand, they are the ONLY attacks you'll get thanks to the Pellinore clause, and we already have a re-standing Vanguard in the form of Homura Raider. And if the intent is more Drive Checks, Shibarakku Buster exists, and he seems a bit more cost effective. And Stand Trigger friendly. You can probably miss this.